In a season where broadcast networks are hesitant to cut bait on their lower-rated shows, CBS is standing apart from the crowd. Late Monday, just hours after celebrating its 111.9 million audience for Super Bowl 50, the network pulled Angel From Hell from its schedule, after just five episodes had aired. A Big Bang Theory repeat will take its place this week, while 2 Broke Girls takes over the Thursday 9:30 p.m. time slot beginning Feb. 18. While CBS stressed that the show hasn't been canceled, it's a clear case of semantics, as the show won't be back unless CBS decides to burn off the remaining episodes in late spring or summer. 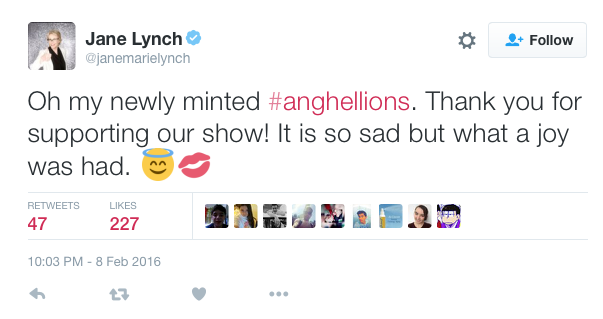 Even star Jane Lynch knows the show is over, as she tweeted last night. Angel From Hell averaged a 1.4 rating in adults 18-49—a number that most new sitcoms would kill for—but the rules are different for CBS sitcoms on Thursday night where The Big Bang Theory, its 8 p.m. show, is averaging a 3.9 demo rating this season. But unlike ABC, which maintains its solid TGIT 18-49 numbers all night, CBS loses nearly 75 percent of that audience by 10 p.m. where Elementary averages just a 1.0. CBS hopes that 2 Broke Girls will keep more viewers sticking around on Thursdays and give a boost to new drama Rush Hour, which will air Thursdays at 10 p.m. beginning March 31. Elementary will shift to Sunday at 10 p.m. on March 20. Angel From Hell was the only freshman show currently airing on CBS that was not featured in a Super Bowl promo. Even Code Black, which has only three remaining episodes this season and whose 1.3 18-49 rating is lower than Angel From Hell's, got some promo love from the network. All season, CBS had seemed puzzled by what to do with Angel From Hell. The series was originally set to premiere in November, but a month before its debut, CBS pushed it to midseason, replacing it with—sound familiar?—2 Broke Girls. 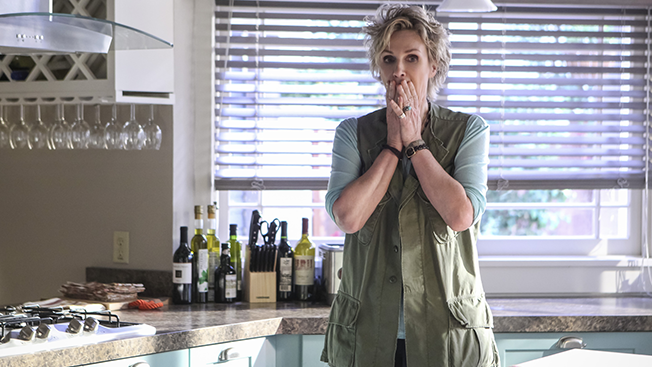 Because ABC, NBC and Fox all opted to reduce episode orders rather than cancel shows outright this fall, Angel From Hell is just the second first-year show to be axed after a handful of episodes. The first, Wicked City, was canceled by ABC in November. Angel From Hell is the third show that CBS has set an end date for in the past month. During the Super Bowl, CBS announced in a promo that The Good Wife will end this year after seven seasons. The move wasn't entirely unexpected, as ratings had begun to drop below 1.0 in the demo this season and the network said last month that creators Robert and Michelle King would be exiting at the end of the season. The Good Wife's season finale will air May 8. Last month, CBS Entertainment president Glenn Geller confirmed that Mike & Molly's sixth season will be its last, despite the presence of Melissa McCarthy, one of Hollywood's biggest stars. Her contract was up after this season, and the show was a reliable bench player but never a breakout hit for the network. On a network with few trouble spots, CBS has to be concerned about its inability to nurture and sustain new hit comedies, especially those that don't air after The Big Bang Theory, which is one of TV's most-protected time slots. One exception has been Mom, which has performed well as star Allison Janney racks up awards and accolades. Life in Pieces is the highest rated new sitcom this season, but its popularity outside of the Big Bang halo remains untested. Ditto The Odd Couple, which also aired after Big Bang last season and won't return for Season 2 until April 7. Last season, CBS shifted The Millers—which had been the top-rated new sitcom a year earlier, thanks to its cushy spot after Big Bang—to Mondays for Season 2, and canceled it after just four episodes. With no other sitcoms on the bench this season, CBS hopes its comedy development slate will help reverse its fortunes next season.